We know about Fuchsia since August 2016 but it’s still full of mysteries. Is it a real project or just a hoax? How will it look like? Will it replace Android completely? Is it going to be a device agnostic OS or aimed specifically at mobile development? As of March 2019, Google made no official statements regarding Fuchsia. So all we can do is keep track of any news about this allegedly revolutionary operating system and test the things which its developers have already made available to the public. In this article, we’ll explain what Fuchsia is based on those pieces of information that we’ve managed to collect on different professional resources. We’ll also make some guesses about the fate of Android and the date when we can expect the official release of Fuchsia OS (if it ever happens at all, of course). How does Fuchsia look like? Is Android era close to its end? 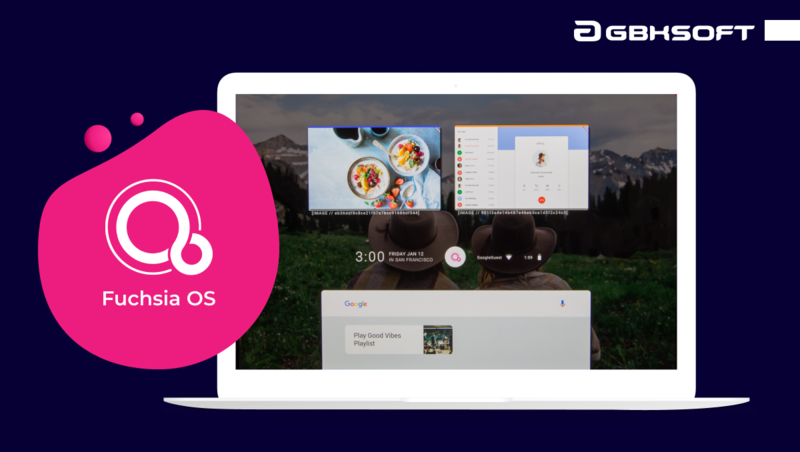 Fuchsia is the third operating system in Google’s portfolio that also includes Chrome OS and Android. As of today, it’s under development and many aspects are kept secret. However, the project is currently available on GitHub so we can make some preliminary conclusions about it. First of all, Fuchsia differs from Chrome OS and Android since it’s designed for different platforms. The desktop and phone-centric versions of its user interface have been already been shown to the general public. Actually, anyone can install them to a supported device (Pixelbook or Android smartphone respectively). So you have an opportunity to try it out for yourself if you want to. 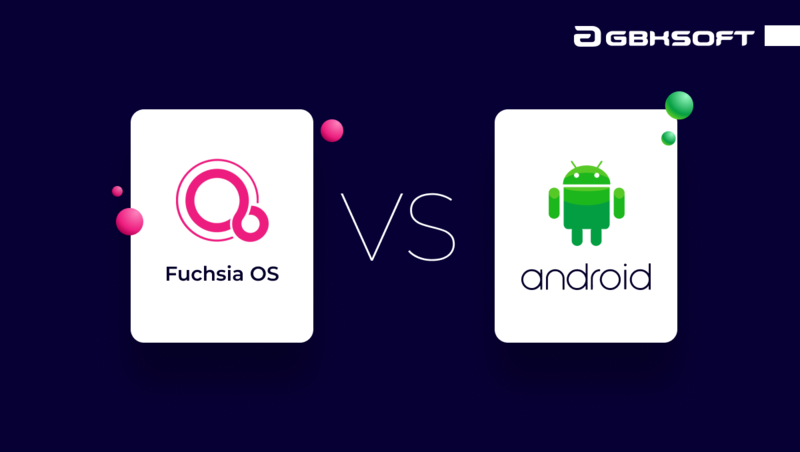 However, rumor has it that Google envisioned Fuchsia as a penultimate OS for a wide range of gadgets such as tablets, smart watches, smart speakers, smart home hubs etc. If it’s true, Fuchsia OS will have all chances to become a market leader since IoT is expected to significantly grow in popularity in the nearest future. How to Power Up Your Business with IoT Apps? Further, unlike two other Google’s operating systems, Fuchsia is not based on Linux. Developers used Zircon microkernel for this project. And this means we’re going to see a completely new and standalone product rather than just an upgraded version of Android or Chrome OS. Although Fuchsia is still on its early stage of development and no one knows how this OS will look like in the end, some rounds of testing have been successfully performed and we can observe their results. At this point, we are not able to take a comprehensive look at Fuchsia’s functionality. But at least we can raise a veil a little bit to satisfy our curiosity. As mentioned, there are two versions of Fuchsia’s UI: desktop (called Capybara) and mobile (called Armadillo). Both of them are built according to Material design rules. And it’s no wonder since Material design is a big Google’s thing that is forecast to overcome a flat design trend soon. A truly unique feature of the Fuchsia design is the way a screen is presented. To be more precise, you’ll not see the traditional rows of app icons on it. Instead, there will be a scrolling list of the cards representing the apps. Other elements you’ll find on a screen include a profile picture, date and time, location, Google bar with suggestions for you, and a battery icon. This is another feature we haven’t seen before. If you take one app icon and drop it on top of another app icon, a screen will split up and you’ll be able to use both applications simultaneously. In desktop orientation, you can choose between vertical or horizontal split. And both Fuchsia’s UIs allow you to have up to three apps in a split-screen mode. Google hasn’t revealed any Fuchsia’s functions which can be considered completely brand-new. The functionality of this OS that is currently presented to the public is rather limited and includes many placeholders. Basically, the things you can do with Fuchsia now are quite primitive. For instance, you can switch between several profiles. And you can even enter your email address and password to login but the system will not let you go any further after that. The Wi-Fi doesn’t work, but if you’re trying out a desktop version on Pixelbook, you can connect to the Internet via USB Ethernet adapter. The Google search bar will bring you no real results and the apps do not work at all or do some basic stuff (and often fail). Google hasn’t provided us with any explanations of why they started the Fuchsia project at all. When Fuchsia appeared on the horizon for the first time, many thought that it’s Google’s attempt to replace Android with something more advanced and, thus, remain competitive. It’s not a secret that the company faces many challenges related to the support of Android at the proper level since the latter was initially planned as OS only for cameras. So the guess was pretty logical. It was also supported by the fact that Fuchsia is written with Flutter SDK and this means that it can run on Android devices. But it soon became obvious that Fuchsia is going to be a hybrid operating system that will work at least on PCs and phones. That’s why it’s unlikely being built just to fix the problems related to Android. It seems more likely that the main goal is to unite the entire Google empire under one OS. If this is so, then we can just applaud Google’s farsightedness because when smart devices will conquer the world completely, it’ll have a ready and well-developed solution. So we cannot say that the release of Fuchsia will cause a direct threat to Android. But we also cannot rule out that Android will become obsolete when Fuchsia will come on the scene. Especially, given that Fuchsia will support Android apps and it’s now a confirmed fact. Well, no one knows (except for Google, of course). As there is no any official information in this regard, we can only make some assumptions. It’s already known that Google cooperates with some tech giants on Fuchsia project. This means that the company takes this new OS seriously even though Google’s representatives often calls it just an “experimentation”. In addition, Bill Stevenson, a senior developer from Apple, recently joined Google, as he said it, to bring Fuchsia to the market. So the Fuchsia release can indeed be around the corner. Yet, no release window was specified. And considering the early stage of Fuchsia development, it’s much more likely the launch of this OS will take place in three to five years. Before Google decides to reveal more details of the Fuchsia project, no one can tell for sure if it’s an indeed new-gen operating system or just a big empty bubble. There are currently way too many rumors surrounding Fuchsia and it’s just impossible to check all of them at this point. However, in case at least some of these rumors are true (and we believe they are), we have a chance to get a stunning product that will open the door to numerous opportunities for both — programmers and businesses in all industries. Our team will keep an eye out for any news about Fuchsia and we’ll, of course, keep you informed. Looking for a professional coding team to make your app idea a reality?